For most of us, we always look forward for summer to come for there are many great outdoor activities that we can do. Apart from having some time for a vacation it’s the season to show some skin and your curves whether at the beach, resort or just doing some quick errands. This is the time for you to bring out all your summer clothes and keep your bulky winter clothes in the closet. If you’re a beach person these are summer must-haves that you need to have. Going for a swim or dip in a pool is not complete if you are not wearing your swimsuit. I know it’s a great deal for some women to show their curves but there are great swimwear that will perfectly suit your body type and hide those flaws. Just in case you are bold and on the adventurous side wear something skimpy and brightly colored bikinis for it will always attract attention and make you stand out. Basking in the sun for too long is not advisable for we can develop skin cancer, therefore it’s a must to put sunscreen 30 mins. before you expose your skin under the sun. Re-apply from time-to-time as much as possible. There are also many sunscreens now that have high SPF that can well protect your skin from the harmful rays of the sun. 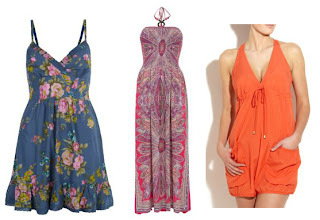 Various summer dresses will complete your summer outfit: from romper, tube dress to maxi dresses. Summer is synonymous to florals and bright colors but dainty pastel shades are also perfect for summer. Here are just some of my cute finds of summer outfits online. They are definitely must-haves during summer for they are comfortable to wear. Choose among various colors, patterns and designs that can also match your outfit. These are perfect accessories wherever you go. You’ll never go wrong wearing sunglasses anytime for they not only will protect your eyes but they are fashionable as well. Be comfortable during summer, wear shorts pair it with cute tank tops and you are good to go.